This is NOT Disney’s Pinocchio. It’s all violence, disaster, cut-throat assassins, hangings, imprisonment, thieves, bullies, greed, murder, more violence, and one ungrateful little puppet. Pinocchio really is a heartless scoundrel. He steals and lies and cheats, and then cries “Woe is me!” when someone steals from him, or lies to him, or cheats him. Well, you got what you deserved, puppet! There are so many problems with this story. The plot is disjointed, the world-building is atrocious, and the magic is odd and inexplicable. The blue fairy is first a dead little girl in a house full of dead people, then she’s a live little girl who takes care of Pinocchio, then she’s grown into a woman within a few months, then she turns into a goat, I think. Not really sure what happened there with the goat. Then she’s a woman again, I think. There was a very confusing scene with a travelling puppet show, where the other puppets greet Pinocchio as a fellow puppet and are overjoyed to see him, and have a big party for their “brother”. Are all puppets alive in this world? Why do the other puppets have strings if they are living beings with their own autonomy? If the puppet master hires them as “actors” for his show, then why would they need strings? They evidently have their own thoughts and feelings. So who is controlling the strings? Confusing. Makes no sense. Weirdness. Another thing that made no sense was poor Jiminy Cricket. In the book he’s just called the Talking Cricket. In the first few chapters, he comes on the scene to warn Pinocchio to do good and go to school and work hard to please his father. But Pinocchio is so enraged at the Cricket that he throws a hammer at him, and SQUASH! Cricket is murdered, flattened against the wall. Then in another scene the Talking Cricket appears to Pinocchio as a ghost, again warning him to change his ways, and return to his father, and go to school. Pinocchio ignores his warnings yet again, and the ghost disappears. And near the end of the book, here comes Talking Cricket, apparently alive and well, congratulating Pinocchio on finally returning to his father and reforming his character. Jiminy, how did you resurrect yourself? Are you Jesus? Did the Blue Fairy bring you back to life? Are you a reincarnation of the previous Cricket? … WHY?!?! What the hay is this nonsense?!! Dead people won’t even stay dead when you kill them. What kind of idiotic world is it where puppets and crickets can’t just murder one another and stay dead?! Or at least explain to me how you are alive again. 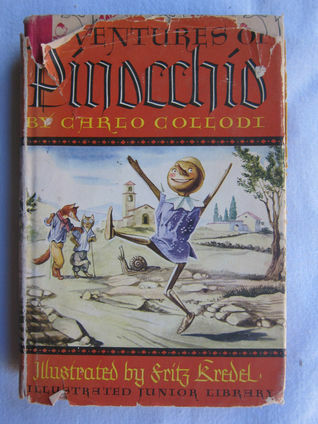 I hated Pinocchio so much! So. Much. He’s ungrateful. He’s sneaky. He’s a big fat liar. He’s a cheat and a thief. He’s selfish and lazy and greedy. If he would make these mistakes once, learn his lesson, and reform, then I would like him. But he does the SAME sins again and again, always promising to reform and do good while he’s in the middle of a crisis or disaster, and then going right back to doing evil when things are going well for him again. Urgh. I was so frustrated with him. Evil little brat! I hate this whole thing. I really do.